The objective is to create a geoDataFrame with buffered geometries AND with all the "attributes" of the original geodataframe. but the result is a geoSeries and not a geoDataFrame, and therefore does not contain the data from the original geoDataFrame nor does it contain an index to join the data to the original data. Is there a better way to perform a buffer while maintaining the original attribute data? It is pretty straight forward to create a buffer on a geopandas geoSeries. Not the answer you're looking for? Browse other questions tagged python buffer geopandas or ask your own question. Buffering point shapefile using gdal/ogr: how to copy over input attributes to output shp? 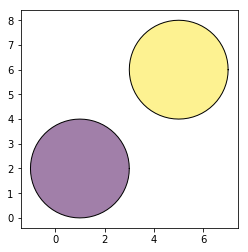 Creating square buffers around points using shapely? Dissolving polygons based on attributes with Python (shapely, fiona)? How to display large geospatial data in a jupyter notebook with style and tooltip?